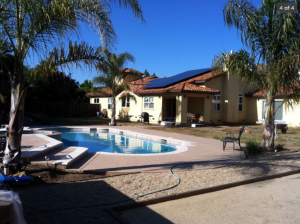 The Farnsworth Swim School is nestled in a beautiful backyard of a private home in Almaden Valley surrounded by trees. The pool is 14 yards long and is a salt water pool. We are proud that the pool is salt water, and not chlorine, because it is better for everyone’s health. Our clients love having the pool in a private home because it creates a personal family feel that is welcoming for everyone. The pool is solar and gas heated to 86-90 degrees, making it perfectly comfortable for all ages, especially the younger kiddos. The pool also has a beautiful cabana for changing and getting ready for your lessons. 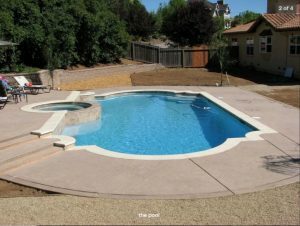 The homeowner is a long-standing client who loves to contribute to the swimming needs of the Almaden Valley community. There is ample seating and shade for clients, so that they can watch their family members during swimming lessons. There is also plenty of street parking. The gate is left open during lessons and clients can simply walk through the gate. Lesson hours are 9:30-1 and 2:50-7pm during the Summer Season. Gate is closed between 1-2:50pm.